JOHN SMEDLEY 1017WSIG RETRO SIXTIES BLOCK STRIPE MOD CREW NECK JUMPER (Snow White). 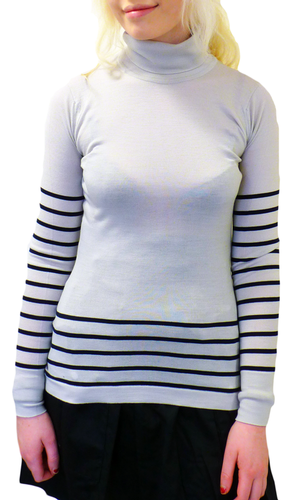 Sophisticated, casual and elegant, the 1017WSIG Retro block stripe jumper by John Smedley. 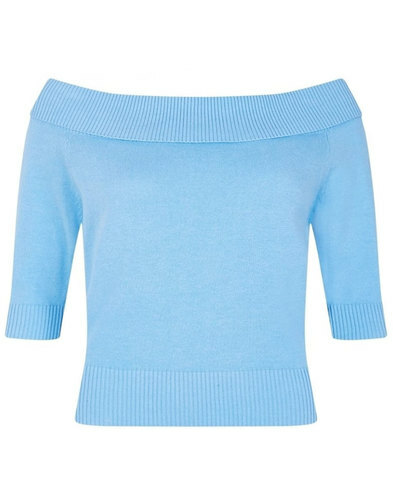 A delightful fine gauge knitted jumper in a flattering slim fit block. John Smedley 1017WSIG Block Stripe Jumper. 10171WSIG by John Smedley is made from luxurious extra fine merino wool and features a subtle Autumnal colour palette of plum, grey, snow white and black. Sixties Mod block stripes throughout. Fine rib crew neck and elegant slim fit make the 1017WSIG Jumper by John Smedley a must have addition to any Retro Clothing collection. Ribbed hem and cuffs, Made in Great Britain. 1017WSIG John Smedley Retro Block Stripe Jumper. JOHN SMEDLEY 1017WSIG RETRO SIXTIES MOD BLOCK STRIPE FINE KNIT JUMPER. 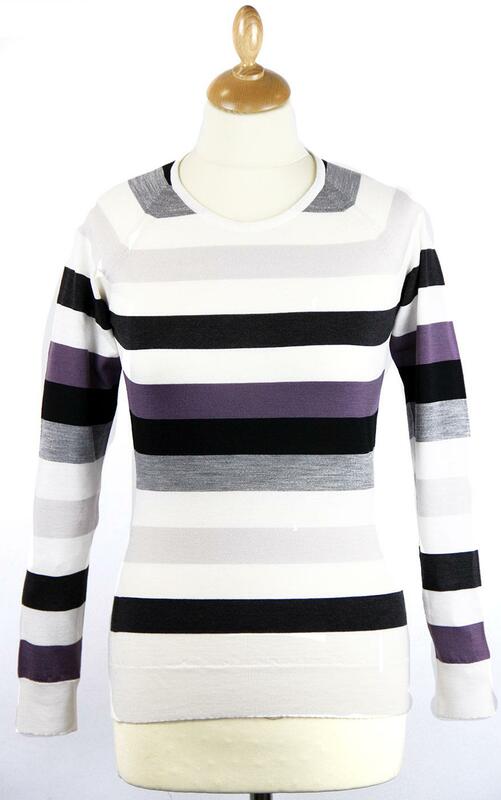 1017WSIG RETRO SIXTIES MOD BLOCK STRIPE KNIT JUMPER by JOHN SMEDLEY - Luxurious Sixties Mod slim fit crew neck fine gauge knit jumper with Snow white, plum, grey and black Retro block stripes. Ribbed cuffs and hem. Made in Great Britain. 1017WSIG Stripe Jumper by John Smedley. Composition: 100% Extrafine Merino Pure New Wool. SKU: 1017WSIG John Smedley Block Stripe Jumper. JOHN SMEDLEY 1017WSIG Retro Sixties Mod Block Stripe Jumper. John Smedley women's slim fit. This style is a fashion fit creating a slim and close to skin silhouette. The waist is shaped, the sleeves and armhole are closer fitting and lengths vary according to individual styles.